Your morning routine might look something like this: You roll out of bed, yawning and knowing full well if there is any hope you will start your day off right, you require a cup (or three) of coffee. Well, I don’t hold anything against a great cup of coffee, but there’s mounting evidence that switching to tea as your daily go-to beverage could make you healthier. Researchers from the cardiology unit at Georges Pompidou Hospital in Paris presented their pro-tea findings at the recent European Society of Cardiology Congress. 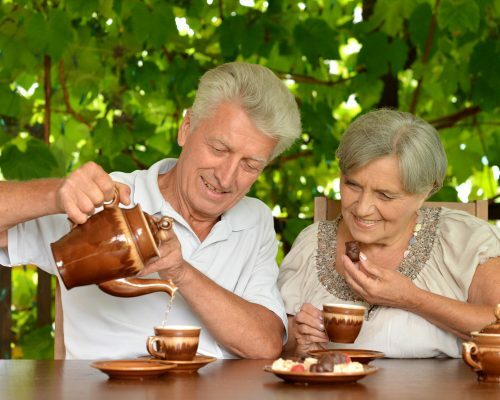 Their study looked at coffee and tea consumption and associated lifestyle habits of more than 130,000 participants between the ages of 18 and 95. They were given a questionnaire about drinking coffee or tea and other health habits, and then were divided into smoking and non-smoking groups. Questionnaires were completed in 2008 and scientists allowed a follow-up period of four years to assess the health of the participants. During the follow-up, over 700 people had died from both cardiovascular and non-cardiovascular issues. Those who drank the most coffee (four cups or more a day) had a heightened risk of cardiovascular death (sudden death because of heart problems). The numbers only increased if the coffee drinker smoked cigarettes, too. In fact, 57 percent of people who drank more than four cups of coffee a day also smoked. Researchers say that while coffee isn’t bad or dangerous in moderation, or on its own, it often goes hand-in-hand with poor lifestyle habits. Another interesting finding was that men were slightly more likely to be heavy coffee drinkers than women. Now this is where tea starts to shine. Tea drinkers were much less likely to smoke, sitting at only 17 percent. Those who drank tea and abstained from coffee were also more likely to be active, with 45 percent of them engaging in regular physical activity. Why are the tea drinkers healthier? Black, green and white teas are all made from the same plant (the Camellia sinensis plant), but each type undergoes varying amounts of processing. Black tea is the most heavily processed while white tea is the most lightly processed and green falls in the middle. No matter which type of tea you prefer, all three contain significant amounts of catechins, a type of disease-fighting antioxidant that helps to fight off cellular damage in the body and protect your heart. Two rules of tea, the longer you steep it, the more you benefit from the concentration of antioxidants. The second is drink it black. A 2007 study by Charité Hospital in Berlin found that a certain group of milk proteins – caseins – blunted any potential benefits of tea. Some experts say this is why the United Kingdom, which its high consumption rate of milky tea, hasn’t seen a reduction in the number of cases of cardiovascular illness. Brits love their tea, but most prefer it with milk or cream. Taking it black is recommended to achieve maximum health benefits. While a cup a day of green tea has great antioxidant power, don’t overdo it with this kind of tea, either. According to the American Chemical Society (ACS) too many polyphenols (a type of antioxidant) can lead to liver toxicity. The ACS says that while up to 10 full cups of green tea per day doesn’t tend to be a problem, watch those supplements that contain green tea. Liver toxicity has been noted for amounts from 700 mg to 2000 mg in supplement form because of the ultra-concentrated polyphenols. If you can’t live without your coffee, try cutting down and occasionally subbing in tea (hold the milk!) for your morning start. Even if you aren’t a smoker and are physically active, that antioxidant kick certainly is good for you!